Saffron Tree: How Are You Peeling? Some books are hits because of their verse, some because of their illustrations, but some others are loved because of their outrageously unique concept. How Are You Peeling? is of the third kind. It takes you into a world where the produce section of a grocery store comes alive with moods. The book does little talking and more expressing. Photographs of bell peppers, apples, kiwis, oranges - all of which are sporting some emotion - predominate over the text which just labels the emotion. Happiness, pride, anger, fear, surprise - they are all in there. The blurb claims that the creators of the book hand picked "expressive" vegetables, did a bit of carving with sharp paring knives, and replaced their eye-slots with black-eyed peas to produce the desired effect. There is one picture of a surprised apple. Its 'mouth' is rounded up in shock, its 'eyes' are perked up in an arch. This picture is Kodi's favorite - every time we pick up the book, the first thing he wants to see is "Aappil O." How Are You Peeling? is fantastic way to talk to little ones about their feelings. It came to my rescue once, right in the middle of Kodi's tantrum. I pulled him to my lap, opened the book and turned to the page which showed a really angry bell pepper. I told Kodi, This is what you look like. One look at picture and the tantrum melted to giggles. Last Word: A book for all ages to talk about emotions and amaze at how much vegetables can communicate with their facial features! Food for Thought - that teaches numbers, shapes, colors. Play With Your Food - that tells you step-by-step, how to create animals and objects from fruits and veggies. Love it! Reminds me of veggietales. 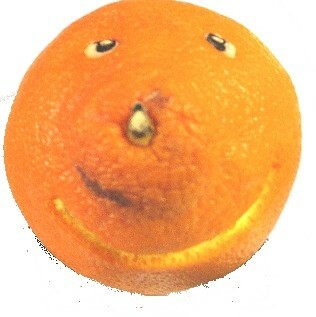 A Drunk Orange? That tops it all!!! You should've seen the grin on my face...You made my morning! let's try a positive spin - it looks more like a "saadhu/one who's given up all vices for the goodness of mankind" kinda expression! Oh wow!! WHAT A cute book and an even more outrageously cute review. I sooo need to get this for us mood swingers at home!! This one tops my list!